In times of peace, perhaps more than in war, complacency can be deadly. In war, at least, political leaders and commanders know that moments of benign assumption are a reprieve, however unwise, from the main bloody game. And the war will not last forever. There will be winners and losers. But in times of peace, especially a long peace, the temptation is to believe peace will last. East Asia has enjoyed an exceptionally long peace since the brief Sino-Vietnamese conflict in early 1979. Since then, the region has been consumed by a seemingly inexorable growth in prosperity, accelerated by the reforms that turned China into the world’s second largest economy. 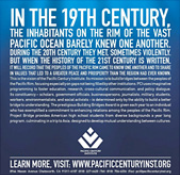 Add to that the US-led international financial architecture put in place after the Second World War, the explosive growth in global trade, the proliferation of regional and multilateral organizations, the rise of the European Union, the expanding initiatives of the Association of Southeast Asian Nations, and one can be forgiven for believing that globalization and the interdependence of nations have ensured peace on a scale not known before — especially in Asia, the region that has perhaps benefited the most from the current international order. But all is not well. That was the case 100 years ago in Europe, when few predicted that the economic interdependence of the continent and its network of alliances would suddenly unravel into the carnage of the First World War. The situation today in Ukraine is an obvious case in point about what can go wrong in the face of complacency. In East Asia, there has been a profound re-emergence of geopolitics in recent years, driven largely but not exclusively by rivalry between China and the US, that potentially threatens peace and security in the region in ways unseen since the worst days of the Cold War. Despite a growing awareness of that trend, the situation has grown worse in the last two years. 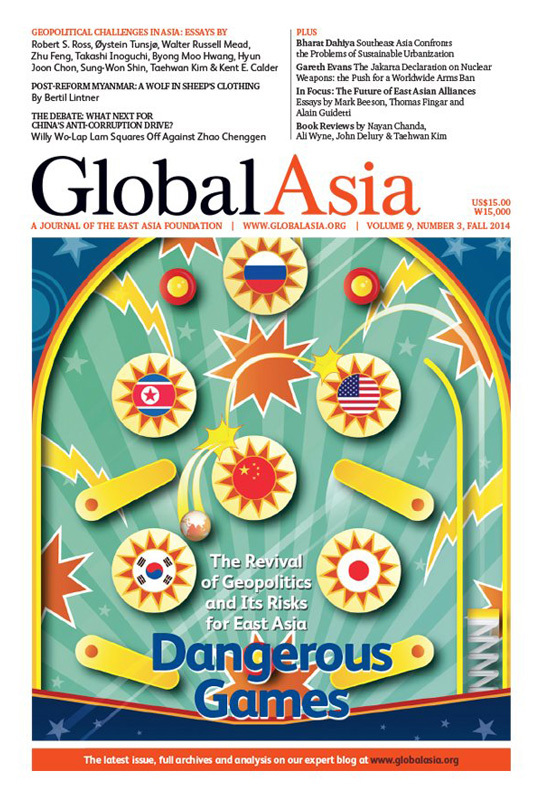 In this issue of Global Asia, we look in depth at the emerging security risks around the region that could lead, even inadvertently, to conflict or even war. Our cover package, Dangerous Games, explores the rise of geopolitics in East Asia, examining the dynamics at work in each of the major countries. Given the exceptional importance of geopolitics in the region, our In Focus section looks in detail at the role of the US alliance system and the ways in which it is being challenged. In our Book Review section, we highlight a work that describes China’s growing presence in Africa and its geopolitical ambitions there, and a volume of essays that ask whether the US-China rivalry mirrors the conditions that led to the outbreak of the First World War. In our Features section, we chronicle the state of political reform in Myanmar and the geopolitical calculations of its military-dominated government. Finally, we also publish the “Jakarta Declaration on Nuclear Arms,” recently released by the Asia-Pacific Leadership Network for Nuclear Non-Proliferation and Disarmament, with a introduction by Gareth Evans. It lays out steps aimed at securing the region, and the world, from the horrors that have been visited so far only on one Asian nation. Northeast Asia has enjoyed an exceptionally long period of peace since the end of the brief Sino-Japanese conflict in 1979. But all is not well. There has been a profound reemergence of geopolitics in recent years that potentially threatens peace and security in the region in ways unseen since the worst days of the Cold War. 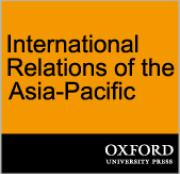 The Revival of Geopolitics in East Asia: Why and How? China's rise dominates concerns about the state of the region's security structure. Why conflict between Beijing and Washington could be sparked more easily today than it could between Moscow and Washington during Cold War days. A wave of geopolitical conflict has upset the argument that we had entered a post-historical world order. China’s stronger posture does not herald a new Cold War or represent Beijing’s desire to overturn the liberal world order led by the Unites States. Shinzo Abe’s second time round as Japan’s prime minister has been marked by global fascination with Abenomics, his attempt to revive the Japanese economy. 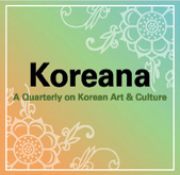 How much longer can Pyongyang persist with its military-centered strategy of self-reliance? Russia's drive to overhaul its economy means it is taking its opportunities in East Asia more seriously than ever. There is more to international relations than the struggles of nation states. Look to non-state actors, regional bodies, even cities to understand geopolitics of the future. What Next for China’s Anti-Corruption Drive? As the hunt for high-level targets looks to be winding down, it remains unclear whether real reform of the system is still on the cards. The Communist Party has overcome many political upheavals in its history and is bound to overcome its current shortcomings, including corruption. The former pariah was lauded globally for its reform efforts, but the military's grip on power remains far tighter than many imagine. If the region is to enjoy the benefits of its rapidly growing cities it will have to tackle the problems that urbanization brings by taking advantage of both traditional knowledge and modern technology. Dozens of influential former political, diplomatic, scientific and military leaders have launched a new initiative to press for nuclear weapons to be eliminated worldwide. Here we reproduce the declaration's text. Can Asia’s Alliances Still Keep the Peace? The extensive US alliance system in East Asia looks ever more targeted at Beijing. Could that risk miscalculations and even conflict? China’s rise and Japan’s efforts to become a more ‘normal’ nation are a chance for greater multilateral co-operation. There are complex dynamics and lessons for the US in the quietly growing strategic partnership between China and South Korea. China's Second Continent: How a Million Migrants Are Building a New Empire in Africa by Howard W. French. Blueprint for a New Global Catastrophe? The Next Great War? The Roots of World War I and the Risk of US-China Conflict, dited by Richard N. Rosecrance and Steven E. Miller.